Patricia O’Toole is the author of When Trumpets Call: Theodore Roosevelt After the White House and The Five of Hearts: An Intimate Portrait of Henry Adams and His Friends, 1880–1918. 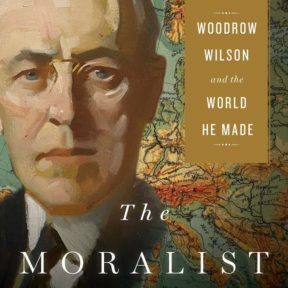 Her new book, The Moralist: Woodrow Wilson and the World He Made, has just been published by Simon & Schuster and I could not be happier for her! Booklist calls the book, “An elegantly and wittily written, deeply nuanced, and finely argued biography, a notable addition to the large Woodrow Wilson collection.” I was lucky enough to have read the book in draft form and was mesmerized by her incredible achievement. Congratulations, Patty!